“I wanted him to write “for my #1 fan” but it turns out I’m #50. A whole in space/time sends the TARDIS, with a Companion-less Doctor, into our world. There he meets Ally, a 12-year-old girl who is a huge fan of Doctor Who and shows the Doctor the influence the show based on his life (more or less) has on people, especially her. But why is the Doctor here, and can he, Ally, and Matt Smith stop a Cyberman and a school bully? For this one I find myself grading on the same curve I give to multi-company crossovers. 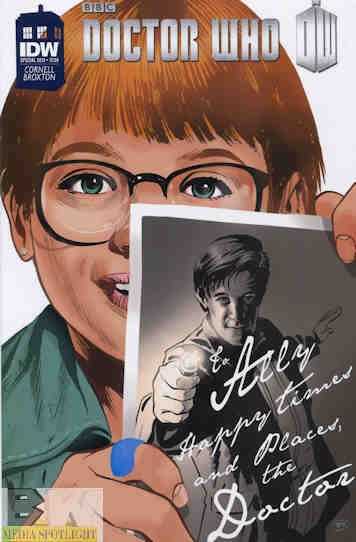 This comic celebrates not only Matt Smith, as he leaves the role of the Doctor, but also the series, as this is the last IDW produced Doctor Who comic. I’m not sure why they couldn’t renew the license as they were the first US comic company to bother trying and they’ve done a darn good job. Personally, I’d rather see them lose Transformers, since I’ve been more critical of that run and with my current unemployment status have no draw to pick their titles up. (Except maybe Windblade because the writer is the same one that made me like comic book Dinobots for the first time ever.) At least they still have Godzilla and Ninja Turtles and have nailed both beautifully. Mostly. Seeing as this is both a good-bye to Matt Smith and IDW, I’m not surprised they went for the “fictional character goes to the real world and find out he’s fictional” storyline, overdone as it may be. It’s total fanwork here but to its credit it was an interesting story. The Doctor took things a bit too well, or would have if he wasn’t the Eleventh Doctor. He seems to take everything in stride. Having Claire not here was probably a good idea, and since Eleven has been willing to give his Companions their personal lives as well as time traveling in the TARDIS there was no conflict involved. The plot device is just used, as how it should be used, to show the influence of Doctor Who on the show’s fans. Ally isn’t some crazed fangirl but an honest fan who learns to stand up for herself after meeting the real Doctor. Even her mother sees the positivity that comes from her fandom, and it’s nice to see fans treated in a positive light rather than with scorn or ridicule failing at parody. I know I gave Gary Russel flak during the original miniseries, but part of me would have liked to see him write the last story and bring it all full-circle, maybe with the same artists. That said, Cornell tells a darn good story, with heart and love for the show and the fans, the latter being the only one I can recommend this comic to based on those ties. Again, I’m grading on a curve based on intentions, and non-fans shouldn’t really start here, but it’s a proper farewell to Matt Smith and to IDW’s run on the comic. If another US publisher picks up the series, they would be well-advised to look at the IDW titles (personally I would point to Tony Lee’s tales) to see how it should be done. Posted by ShadowWing Tronix on December 28, 2013 in Television Spotlight, Today's Comic and tagged Doctor Who, Eleventh Doctor, IDW Publishing, Matt Smith, Paul Cornell, TARDIS.